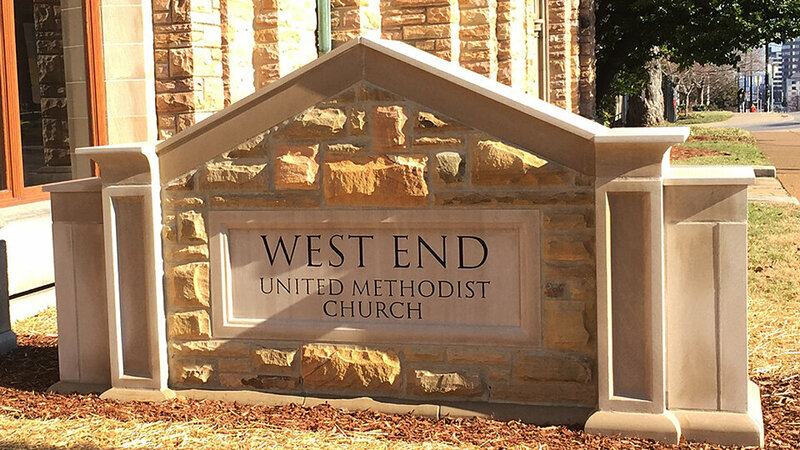 During 2014, the congregation of West End came together and raised $62,304 to be used to erect a permanent sign for our church on West End Avenue. Our church has been on the corner of 23rd and West End for over 86 years, but without a permanent sign, our church was often overlooked or thought to be part of Vanderbilt Univeristy’s campus. Senior Pastor Michael Williams and others believed that we should be identified in a permanent manner to reach out to the community and let them know who we are and be the loving light of Christ. The sign was well planned and designed to reflect our unique architecture and building. The goal was to have a sign that looks like it was built with the church. After several drawings and specs, the end result is a wonderful example of West End UMC. The structural aspect of the project was completed in late December 2014. During the Spring of this year, watch for landscaping and ground cover to be added to the project.